Animals Asia’s Vietnam Bear Rescue Centre faces eviction and relocation following an aggressive campaign against it by the director of Tam Dao National Park, Do Dinh Tien. On Friday 5 October, the Ministry of Agriculture and Rural Development (MARD) informed Animals Asia that the Ministry of Defence has issued an order to evict the sanctuary operation and its 104 rescued bears. Animals Asia is a charity that is devoted to ending the barbaric practice of bear bile farming and improving the welfare of animals in China and Vietnam. This follows Mr Tien lobbying the Ministry of Defence to declare the sanctuary to be an area of “national defence significance”. The park director has been pressuring Animals Asia to relinquish 6 hectares of land since April 2011. It is believed that he intends to hand the land over to the Truong Giang Tam Dao Joint Stock Company, in which his daughter has an investment. The company has submitted an application for development of an “eco-tourism park” and hotels. The closure would see 104 bears that have been rescued from the bile industry evicted, 77 local Vietnamese staff made unemployed, and financial losses to Animals Asia of more than US $2 million. The local economy that depends on the centre would be severely impacted, and the Vietnamese government’s commitment to ending bear bile farming would be called into question. 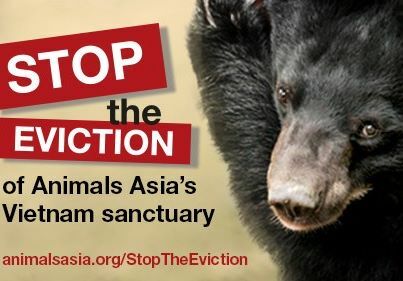 The eviction is in direct violation of the Vietnam government’s 2005 agreement with Animals Asia to fund and develop a facility on 12 hectares of the park that would permanently rehabilitate and house 200 endangered bears rescued from the illegal bear bile industry. Based on this agreement, Animals Asia has invested more than US$2 million in building and infrastructure. Currently 104 bears rescued from the bear bile industry are living on the site. The bears are being rehabilitated after years of trauma from being locked up in small cages and milked for their bile. These bears will be forced to return to cages to be relocated. This will have a major negative impact on their mental and physical well-being. It is likely to take at least two years to establish a new centre with outdoor enclosures. Mr Tien and the Truong Giang Tam Dao Joint Stock Company have been lobbying the Vietnam Administration of Forestry, within MARD, to approve the real estate development. Mr Tien’s daughter is one of four founding members of the Truong Giang Tam Dao Joint Stock Company and holds 10 percent of the company’s shares. Mr Tien has not publicly disclosed this information. Following interventions by local embassies (including the British, US, Italian and Australian ambassadors), international organisations and European Ministers, as well as significant media attention, MARD intervened to issue a directive on 26 April 2012 ordering the park director to allocate the land to the bear rescue centre in line with the original agreement with Animals Asia. Mr Tien then spread misinformation, in an attempt to block construction of the third outdoor bear enclosure, that waste pollution from the rescue centre was damaging the environment and health of the local community. He requested that the Ministry of Agriculture close down the rescue centre and relocate the bears. Following an exhaustive investigation by the Vinh Phuc environmental department, the bear centre was cleared of all allegations. It was at this point that the park director began lobbying the Ministry of Defence to apply pressure on the Ministry of Agriculture to stop the rescue centre’s planned development. The claim that the land in question is an area of national defence significance is questionable, given that the centre has been in operation since 2005 and that the Chat Dau Valley, where it is located, has been used for tourism and other private purposes since the park opened in 1996. It is believed that once the bear centre is forced to close, the land will be declared to no longer be of national defence significance, allowing the Truong Giang Joint Stock Company to take it over for private development. The case will now go to the Prime Minister for a final decision. Due to the powerful status of the Ministry of Defence in Vietnam, it is feared that the Prime Minister will be forced to agree with the recommendation to close the centre. The mission of the Vietnam Bear Rescue Centre is to rescue moon bears (Asiatic black bears) and sun bears from inhumane captivity and the illegal bear bile industry. The centre was authorised by the Ministry of Agriculture and Rural Development in 2005 and given project approval in a directive from the Prime Minister of Vietnam in 2008. It has been a great example of cooperation between an international charity, the Vietnamese government, the Vietnamese people, as well as supporters and donors around the world. The 2005 agreement between the Ministry of Agriculture and Animals Asia provides 12 hectares of land for the bear rescue centre in Chat Dau Valley, Tam Dao National Park. Animals Asia has invested over US$2 million in funding to build the rescue centre through developing the first 6 hectares. This funding was donated by thousands of people from around the world who gave the money in good faith, hoping to help bears rescued from the bile industry. It is currently unclear whether Animals Asia will be compensated for the relocation and its losses, or would need to find the funds to start construction again at a new location. There are over 10,000 bears – mainly moon bears but also others such as Malayan sun bears and brown bears – kept on bile farms in China, and around 2,400 in Vietnam. They’re “milked” regularly for their bile, which is stored in the gall bladder. The bile is used as a form of medicine, even though many herbal and synthetic alternatives are available. Starved, dehydrated and riddled with ailments, the bears suffer a living hell. Animals Asia is working to end bear bile farming in China and Vietnam, where bears are kept in small cages for up to 30 years so their bile can be extracted through catheters, needles and open wounds.